Between laundry, cooking, school lessons and jobs, our days can be so busy that after we finally tuck our little ones into their beds at night, we realize that we just went an entire day without spending quality time with them. That realization doesn’t feel good, but we can resolve to make little changes that will have a huge impact! 1) Look them in the eye. When we’re trying to communicate with our kids, looking them in the eye tells them we’re focused on the conversation, we’re serious about what we’re saying, and what they have to say is important as well. Plus, eye contact helps us to listen better and encourages our kids to keep coming to us with issues that are important to them (this will pay off big when they’re teenagers!). Instead of murmuring, “That’s nice, sweetie” when they’re telling us something, let’s focus enough to be able to ask a question about what they just told us. Doing this not only helps us to connect with our kids, but it’s also showing them how to carry on un-distracted conversations with others (another skill that will pay off big-time later!). 3) Set a timer and play a game. Sometimes on busy days I’ll set a timer for 20 minutes, put my phone away, and play a game with my kids. They love it because they know they’ll have my undivided attention until the timer goes off. I love it because I know I can focus on my kids and enjoy the moment without worrying about time getting away from me if I need to keep making progress elsewhere. Go ahead and give it a try – you just might be surprised at how well it works! Whether you’re reading a chapter from a longer book, looking through a short picture book, or listening to a book on tape, experiencing books together is a wonderful way to connect and refresh! This isn’t always easy but letting the little ones help us prepare dinner or fold a basket of laundry is a great way to connect while accomplishing a task. Don’t want to clean but need to exercise? Popping in a workout DVD or taking a walk are also fantastic ways to connect while being productive! I’ve noticed a huge positive difference in my kids’ attitudes when I invite them into what I’m doing verses when I try to nudge them away so I can stay on task. Plus only little once, so when they come up to you while you’re busy, set your work aside for a few minutes and snuggle close! 7) Remember that a few minutes really does count. Sometimes we can get grand ideas about what we think quality time looks like but we shouldn’t let that stop us from embracing our kids now, in the midst of our busy schedules. Just a few minutes of quality time does count, and those shorter minutes throughout the day can go a long way in helping our kids feel loved and important. What would you add to this list? 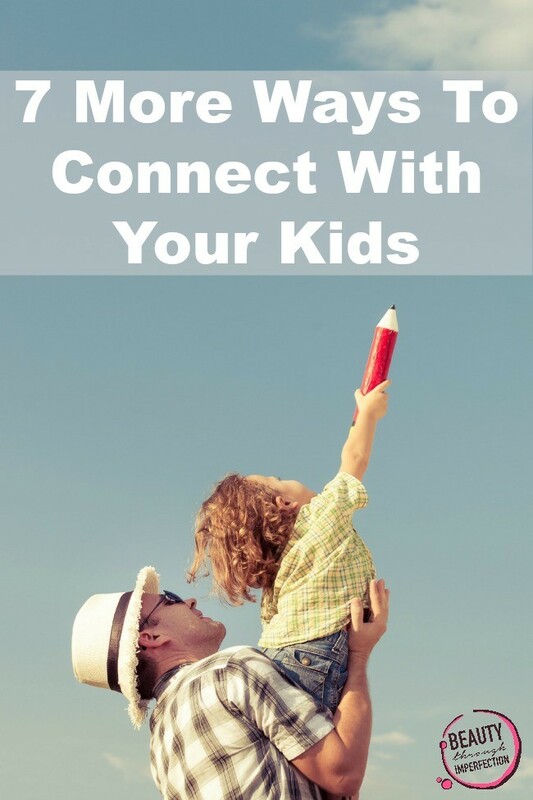 How do you connect with your kids amidst your own busy schedule? Davonne Parks believes that some of life’s richest moments happen when we embrace the beauty of imperfection as we extend grace to ourselves and others. She and her husband, Nathan, have two sweet daughters, Lily and Grace. 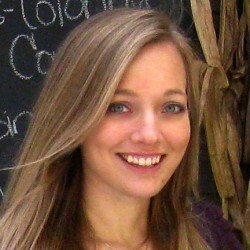 Davonne has written three inspiring eBooks, and she blogs about organization, simplicity, and heart-filled motherhood. Davonne also offers free personalized virtual-organizational tips and fun rewards as part of her popular brand-new Get Organized challenge. Well, in my case, I spend at least one hour a day playing with my two little girls and this way I created a big connection between us. That’s wonderful, Jenny! Thanks for sharing your tip! 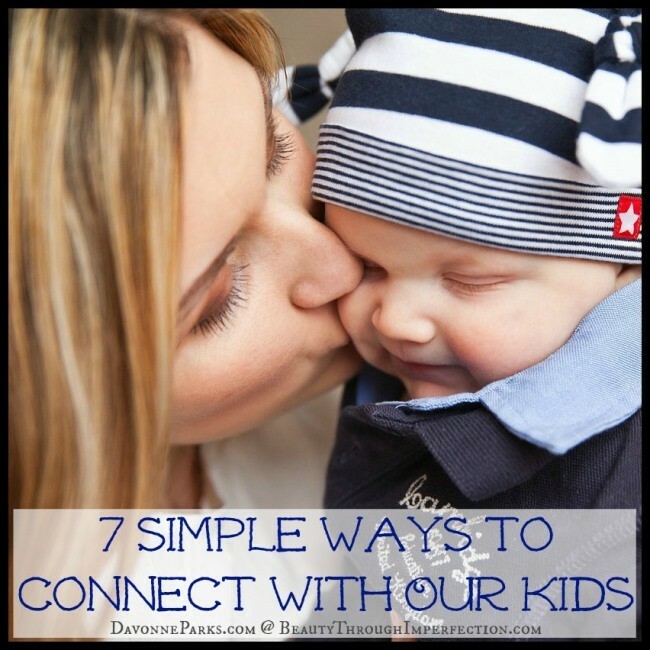 Hey Buddy!, I found this information for you: "7 Simple Ways to Connect with Your Kids". Here is the website link: https://www.beautythroughimperfection.com/connect-with-your-kids/. Thank you.